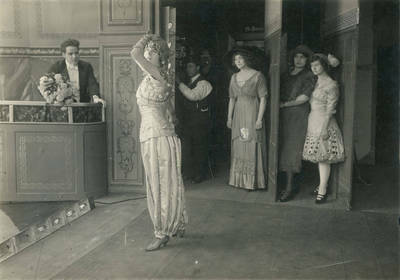 "Marguerite Snow on stage, 1910"
A photograph taken by Carl Louis Gregory; noted on verso by him: "1910 drama of the stage - Wm Russell, enamoured of Peggy Snow as Princess Zuleika; Anne Drew, Fanna Gregory, Violet Hite in the wings." All participated in Thanhouser productions. BW photograph; 6.625" x 4.625"